blue lights blinking). If a PIN is required, enter the code “0000”. 6. Now you can listen to music and make hands-free calls. Pairing instructions may differ between each mobile phone. to search for a Bluetooth signal. and if a password or PIN is needed enter the numbers “0000”. *You may have to select ihiBluetooth and press “CONNECT”. to the station shown on the ihiBluetooth’s display. you can then use the Control Knob to adjust volume up and down. playing device and the other end into the 3.5mm Line-In port on the ihiBluetooth. station shown on the ihiBluetooth’s display. 3- Refer to the chart on the next page for Hands-Free functions. of your mobile phone or audio device. charging symbol on your mobile device to indicate the power is flowing. What do the different indicator lights mean? 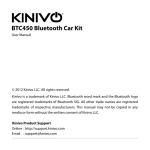 - ihiBluetooth is connected to a Bluetooth A2DP (audio/music) device. 3. How come the audio is not clear through the car speakers? frequency as your car FM stereo. 4. Why can’t I get the ihiBluetooth to pair with my mobile device? 5. Why can’t I play music using my mobile phone? (audio/music) connection, and that it has been paired properly. 6. When I play music I can’t use pause, play, last song, and next song buttons. ihiBluetooth to support AVRCP (Audio/Video Remote Control Profile). - Do not expose the unit to dust, water, or extreme temperatures. - Do not attempt to disassemble the product. - Don’t use intensive chemical products or detergent to clean the product. - Don’t scratch the surface with sharp things. - FM Frequency range : 88.1-107.9MHz (100KHz/Step). and Android when running the latest version of the device software. ARE THE PROPERTY OF THEIR OWNERS. DO NOT OPEN OR DISPOSE OF IN FIRE OR SHORT CIRCUIT.